From Alsún Ní Chasaide‎ on the Facebook group Synthesizer Freaks. Like I spent weeks restoring this & she can’t wait to get on it. If vocoders aren’t for sits, then why are they made of warm? We at CatSynth had the opportunity to play with a Korg VC10 vocoder last year. It is indeed made of warm, as are most analog vocoders 😸. It also had a bit of the Korg grit that characterizes their vintage instruments, and best of all it allowed for external carrier signals (this is something I wish was easier to do on the Roland VP-03). 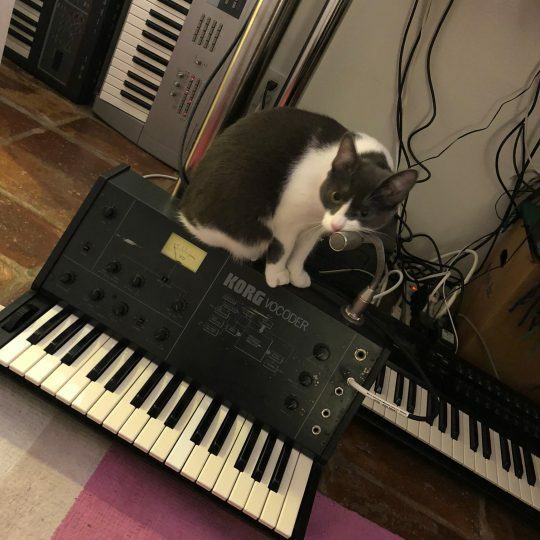 Posted on January 12, 2018 January 12, 2018 by catsynth	This entry was posted in Cats, Synthesizers and tagged analog, cat, korg, Synthesizers, vocoder. Bookmark the permalink. ← Highway☆ 1.2.0 now in the Apple App Store! For sale, BTW. The vocoder – not the cat!! Well, yes. If it’s made of warms, it must be for sitting!